The other day we were tuned in to the History Channel on Astro to catch the documentary on the controversy surrounding the Shroud of Turin, widely believed to be the burial cloth of Christ. 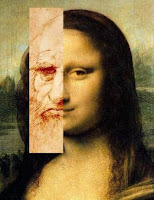 Scientists are convinced that it was a very clever forgery, possibly by the legendary renaissance genius Leornardo Da Vinci. It was ascertained that he did not paint it so how did he do it? Well, I shall not get into specifics but it has something to do with optics, It is believed that he used an optic lens to burn the image onto the cloth, much like what happens in a camera (and our eye sight). The other interesting bit of 'revelation' was that the facial image burned on the cloth was that of himself! Not only that, it appears that the famous Mona Lisa painting could likely be a potrait of himself too based on the closeness of the facial structure. (see pic) Interesting!